Susanne E. Ahmari, M.D., Ph.D.
New research has found that activity levels at receptors for the neurotransmitter serotonin affect aggression and impulsivity in different ways at different times in the lifespan. These findings may help inform treatment for a range of psychiatric disorders involving high aggression, impulsivity, or both, such as drug and alcohol addiction, pathological gambling, and attention-deficit hyperactivity disorder. 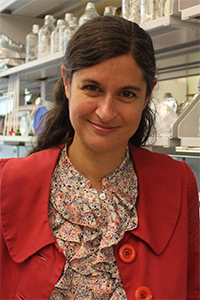 Published April 16th in Neuron, the research was led by 2012 NARSAD Young Investigator grantee Susanne E. Ahmari, M.D., Ph.D., of the Department of Psychiatry at the University of Pittsburgh. The team also included 2007 Young Investigator grantee Kenji Tanaka, M.D., Ph.D., 1999 and 2001 Young Investigator grantee Carlos Blanco, M.D., Ph.D., as well as Scientific Council Member and 1998, 2003 and 2009 Distinguished Investigator grantee René Hen, Ph.D. The researchers looked at changes in aggression and impulsivity resulting from manipulations of one of several receptors for serotonin in the mouse brain, called 5-HT1BR. Activation of this receptor can limit the release of serotonin and other neurotransmitters. Mice bred to have a lack of 5-HT1BR serotonin receptors throughout the brain showed increased aggressive as well as impulsive behavior. But the researchers found that the effects of the receptor on the two behaviors differed. Restoring normal levels of the serotonin receptor reduced aggression only when done early in a mouse’s life. This suggests that some serotonin receptors affect aggression only during a critical period early in development. In contrast, restoring the 5-HT1BR receptor in adulthood reduced impulsivity in the mice, suggesting that impulsive behavior is affected by these receptors across the lifespan rather than during an initial critical period. The team’s results suggest that although aggression and impulsivity can both occur in conditions like addiction, they may require distinct pharmacological treatments. Those treatments may also need to be administered at different times.